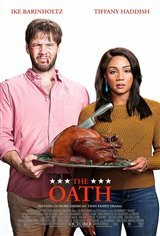 When Chris (Ike Barinholtz) and his wife Kai (Tiffany Haddish) hear that the U.S. government is implementing The Patriot’s Oath, in which citizens can swear their loyalty to the President, they decide they have no interest in complying. It's announced that signing isn’t mandatory, but they discover over the coming weeks that Americans are being pressured to declare their allegiance. As the deadline to sign approaches, Kai gets Chris to agree to avoid the topic during Thanksgiving dinner with their families so they can have a peaceful holiday. However, while watching the news, Chris hears that the C.P.U. (Citizens Protection Unit) has been accused in the disappearance of several dozen activists, including actor Seth Rogen. There are also increased tensions around them as racists begin acting out violently against minorities. When Chris brings the topic up, he finds that the relatives have differing opinions, which creates a division amongst the family members. Adding to the tension are two government officers (Billy Magnussen, John Cho) who arrive to question Chris about his decision not to sign the Oath.